It’s certainly taken a while to settle in, but we can finally say for certain that summer is here to stay for a while. Sunny skies and hot temperatures are an almost daily fact of life, and summer hours have kicked in for both Jenny and I at work, which means we (sometimes) get to leave the office early on Fridays to enjoy the season. But the main reason I know summer is in full bloom is that farmer’s markets are teeming with amazing, fresh produce. I’ve written several times about the fact that one of the things I love most about living in southern Ontario is that we’re only an hour or so away from countless farms that produce a mind-blowing selection of fruits, vegetables, fresh meats and dairy. And in Toronto, we take advantage of this by hosting farmer’s markets in all corners of the city. One of our favorites is the Evergreen Brickworks Farmer’s Market, an oasis of farm freshness set in a lush landscape right in the middle of the city. Walking around farmer’s markets like this on a Saturday morning, looking at and smelling produce often picked just that morning and interacting with the people that actually grew what you’re considering buying really makes you appreciate the fertile land we’re surrounded by and the people who work it. 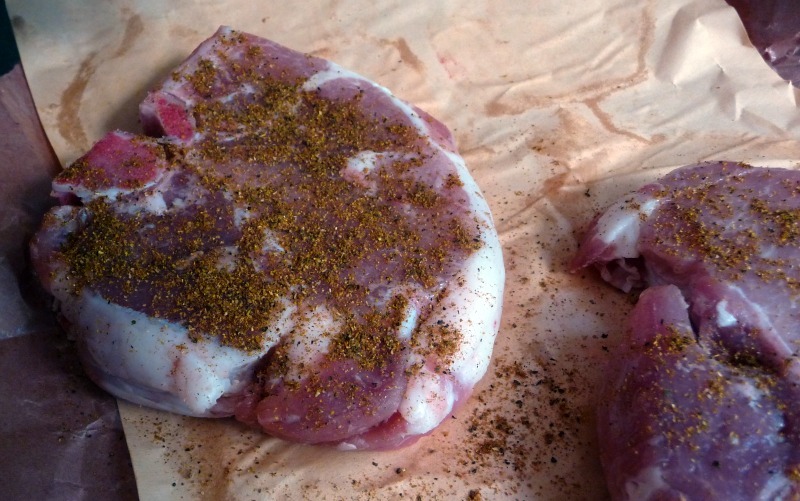 I rubbed the pork chops with some rub that Chef Roger Mooking was handing out to patrons at the recent Toronto Taste event; I’m not sure what was in the rub, but it smelled amazing and tasted great on the chops. 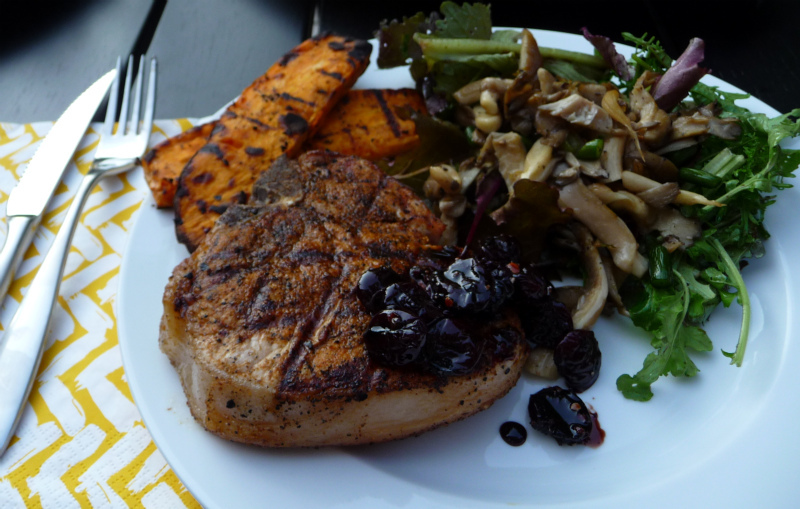 I like grilling pork chops similar to steak, so that they’re cooked just past medium and retain just a little pink in the middle and are juicy. To do this, cook the chops on a BBQ over high heat. Place the chops on the grill and cook with the lid closed for about two minutes. Then turn the chops 45 degrees and cook for another two or three minutes. Then, flip the chops over and cook with the lid closed again for two minutes. Rotate 45 degrees again and cook for another couple of minutes. Remove the chops from the grill and let rest for five to 10 minutes. Chop oyster mushrooms and garlic scapes into smallish pieces. Throw into a pan with some olive oil, salt and pepper over medium-high heat, sautéing for several minutes until everything starts to soften. Add a couple splashes of balsamic vinegar about half way through cooking. Plate mushrooms and scapes on salad mix and top with a generous splash of good olive oil. Jenny had picked up a jar of Composta di Amarene all’Aceto Balsamico (sour cherry compote with balsamic) from Eataly in New York City recently. It’s a jarred condiment imported from Italy that’s basically whole cherries preserved in balsamic vinegar. I threw a couple of spoonfuls in a heated pan with some more balsamic vinegar and chilli flakes, and let it simmer away for several minutes until it began to get jam-like and the vinegar reduced. Then I simply spooned this over the pork chops. If you don’t have preserved cherries from Italy, I’m sure you could easily create a similar condiment with some pitted cherries cooked down in a pan with some balsamic and chilli flakes.